High-performance passive-solar home on 6.31 acres backing to greenbelt & Spanish Creek, 984sf, 1 level, 2 Bed/1.5 Bath with bonus Flex room, additional detached & finished 200sf studio/shop. Attractive custom exterior is combination of stucco & corrugated steel. Interior has lots of natural light & appealing natural look/feel of Beetle-Kill Pine planks. Also custom Angle-Iron & Beetle Kill Pine doors, custom Rainbow Tile counters & Ground-Tin Kitchen backsplash. Baths feature bright colors and custom tile. Passive solar design with supplemental Lopi Republic 1250 Wood Stove and Rinnai EX22CTP Direct Vent Wall Furnace. Concrete slab has radiant in-floor tubing installed for flexible addition of future systems. 2.4KW Solar PV system includes: Outback/FlexMax Inverter & Charge Controller, & Sun Xtender Solar Batteries. Hot water provided by Paloma/WaiWela on-demand propane-fired heater. 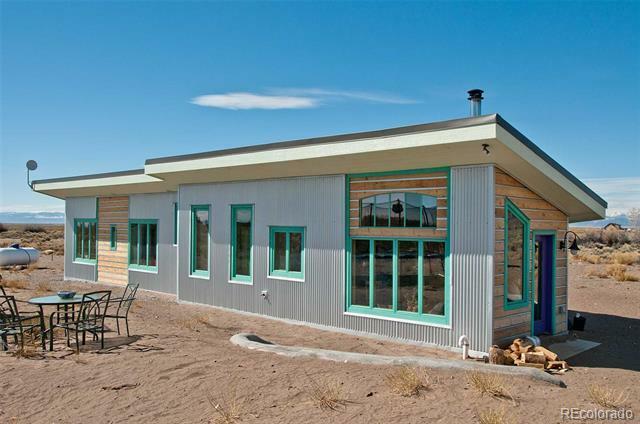 Don't miss out on this efficient, one-of-a-kind off-grid home at the base of the Sangre de Cristo mtns!